Karate-jutsu or the Art of Karate is an ancient and brutally effective method of self-defence that addresses the standard types of attacks that have plagued man kind for thousands of years. Learning how to respond dispassionately to unwarranted aggression requires self-empowerment and Karate-jutsu training promotes this by developing a person's inner-calm, concentration, discipline & self-control. To understand how such an effective form of self-defence could possibly exist, it is necessary to first understand this civil defence system's centuries of evolution. 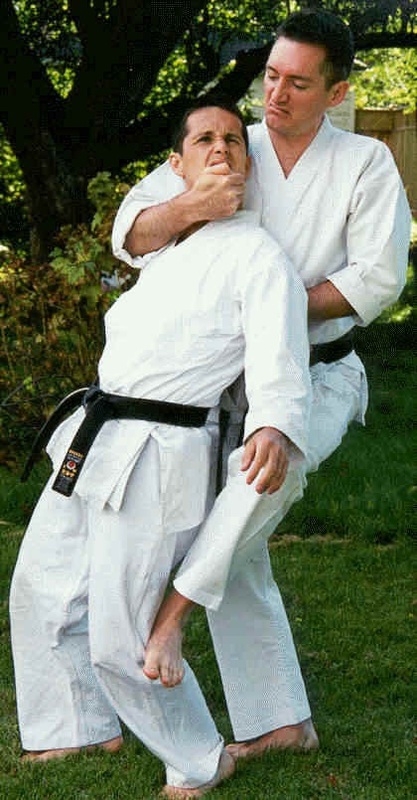 In developing Karate-jutsu, its pioneers realized very early that a response to being grabbed by the hair from behind needed to be different than the response to being tackled around the waist. They concluded that in order to defend themselves effectively they needed to develop different defensive strategies to handle different situations. As a result the arts creators categorized the standard forms of attack into 36 different habitual acts of physical violence. Over hundreds of years of trial and error, they developed the brutally effective responses to each type of attack. 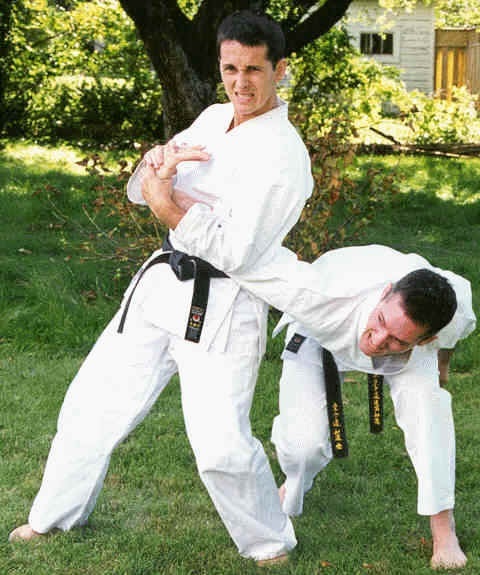 Karate-jutsu training consists of two person drills, where one of the participants re-enacts one of the 36 types of attacks while their partner makes use of the most brutally effective defensive techniques. 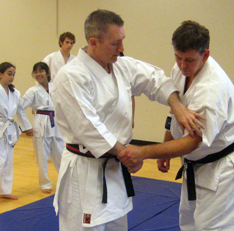 Once a student learns enough of these sequences of defensive techniques, a kata is created to remind the student of which defensive techniques are appropriate for a given set of attack scenarios. 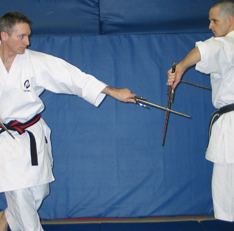 The kata is created by first removing the attacker from the two person drills so that the defensive techniques are performed without a partner. Each one of these sequences of defensive techniques is then chained together to form a solo exercise called a kata. 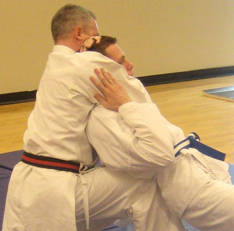 As a result, the kata contains the secrets of the appropriate location, tool, angle, direction and intensity of the defence which is required to address a given attack scenario. "On Ko Chi Shin" - To study the old is to understand the new. 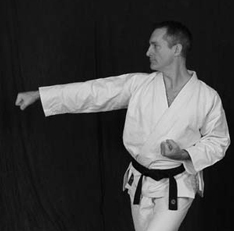 Realizing that the secrets to truly effective self-defence are hidden in the classical kata, we are focusing our resources along with those of the International Ryukyu Karate Research Society towards re-discovering, analyzing, improving and imparting the original principles upon which the kata are based. For a more detailed explanation on the theory and application of traditional kata please click on An Art With A Thousand Faces. The Karate-jutsu we teach is based on a defensive tradition known as Koryu Uchinadi Kenpo Jutsu. Koryu Uchinadi Kenpo Jutsu is a non-competitive, totally application-based defensive tradition compiled into a single cohesive study. It also provides a provocative alternative to conventional methods of physical fitness and stress management. Balancing the tradition's brutally effective self-defence is its moral philosophy which is supported by the Shaolin code of conduct: "Avoid fighting at all costs. However when no other choice is available, hurt rather than be hurt, maim rather that be maimed, and kill rather than be killed." Our Koryu Uchinadi Kenpo Jutsu training comes by way of Sensei Patrick McCarthy of the International Ryukyu Karate-jutsu Research Society. 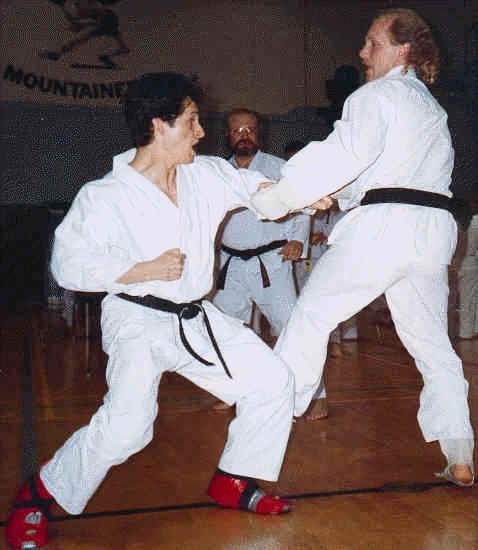 For an overview article on the Karate-jutsu we teach please click on Koryu Uchinadi or for a comprehensive article please click on Thinking Outside The Box. Karate-do or the Way of Karate is a modern fighting method which focuses not only on physical development but also on mental and spiritual development as well. 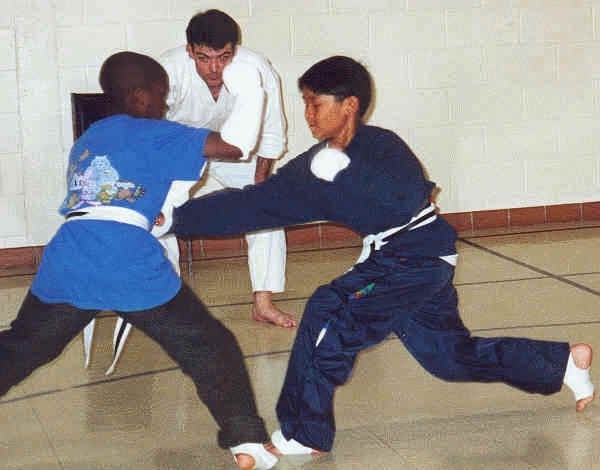 The physical development of Karate-do can ranges from an individual's personal quest to have fun and improve their cardio-vascular efficiency, balance, stamina and coordination, to becoming a competitive fighter who truly represents the apex of physical athleticism. The rewards of mental development include the ability to read and defuse potentially dangerous situations and instinctively react with alertness, calm, and self-confidence. Most important of all is the fact that lessons learned in Karate-do such as being motivated, having self-esteem, patience and humility always apply to daily life. The Karate-do we teach is based on a style called Wado (way of harmony) which was created by Hironori Ohtsuka in 1934. Sensei Ohtsuka was one of the principal architects of modern Karate-do  and one of the two men who revolutionized karate training, by developing and institutionalizing free sparring . The aim of Karate-do is perfection of technique as well as development of a mind that is tranquil yet alive, able to react intuitively and without hesitation to any situation. 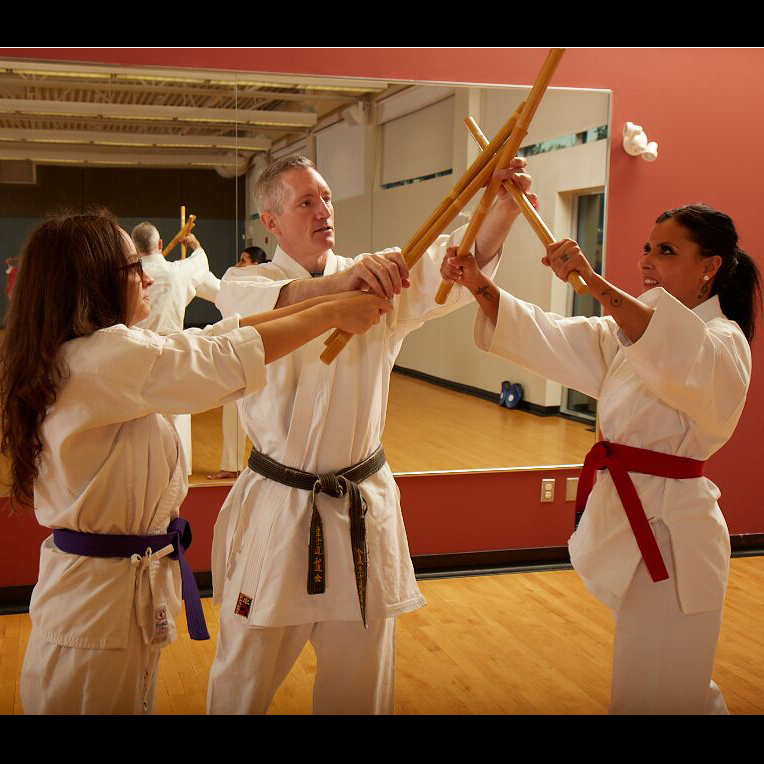 Our Wado-Kai training comes by way of Sensei Masaru Shintani and Sensei Paul Leonard of the Shintani Wado-Kai Karate Federation. Patrick McCarthy, Ancient Okinawan Martial Arts: Volume 2, Tutle Publishing. 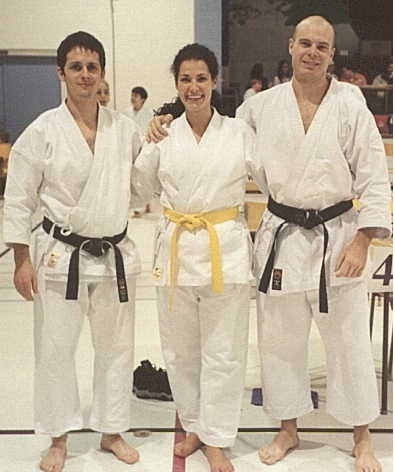 International Ryukyu Karate Research Society, "KSL Q & A", Koryu Journal, 4th Quarter 1999.